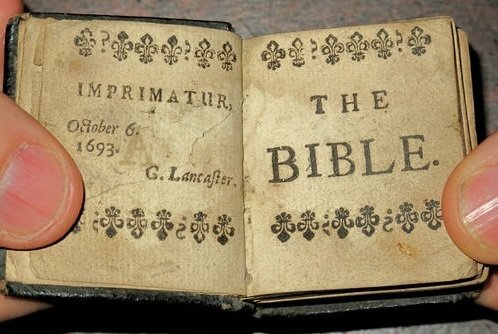 16 books were discovered in a house clearance and titles include The Holy Bible and the 1842 London Almanac. Though they might be minuscule, the largest is 1 1/2 inches and the smallest is just 1/8th of an inch tall, each of the books contain every word that the full-size version contains. The books were discovered by Bamfords Auctioneers in Derbyshire, who will put the up for sale next week. The books had been kept by one family for years. Experts believe they could fetch up to £2,000. The definition of a tiny tome is a book which is no more than three inches in height, width of thickness, says The Miniature Book Society. The books gained popularity in the 19th Century as they were light and easy to conceal, although the earliest book dates to 1475. Other titles include the Bijou Picture of London, from 1810, which comprises 31 pages of engravings of the city’s landmarks and a second edition for Paris from 1812. The Bible contains 376 pages, engraved plates and a magnifying glass in a pocket.